That's the thing with an occasional series, which "Words we get from Greek" most assuredly is, it just happens occasionally. Anyway, to business, meteorology is, as you undoubtedly know, the study of weather and climate. It's Greek roots are τα μετεόρα (things on high) and λόγος (basically word). I used to think it was only the British that went on about the weather as in the joke that Britain doesn't have climate it has weather, but here on Skopelos people pay great attention to the weather. It's not surprising really, a lot of Greek life is spent outdoors, tending olive trees, growing vegetables or even just sitting outside drinking coffee or eating. The weather has a bearing on all these activities. Will it rain? When will it rain? Will it be enough rain? People also go on about whether it's too hot or too cold. I suspect it's only human never to be completely satisfied with something such as the weather over which we have no control. Definitely the wrong sort of rain. A storm in September, 2012. Of course, it's not just landlubbers who worry about the weather, seafarers also pay great attention to the forecast. Skopelos is an island and the only way to get here, other than for a few exalted types who have access to a helicopter, is by sea. If it gets stormy then shipping can't get through, certainly not to land cargo and passengers and so we go without. As I write this, we are awaiting high winds and possible snow (more likely to be rain). Friends who needed to get to Athens for a flight left a day early in order to be certain that they could get off the island. As I said, people pay attention to the weather here. On Sunday, the views were crystal clear and we could see all the way to Mount Olympus, the top of which is covered in snow as are the peaks on the nearby island of Evia. A light scattering of snow from January this year. The use of the word τα μετεόρα might just have rung a bell with some of you, particularly if I type it as Meteora. This is the site in the middle of Greece famous for its monasteries which are built on top of rocky outcrops. I don't know for sure, but I presume the name derives from "things on high" as does meteorology. Certainly I imagine the monks in their lofty homes paid great attention to the weather, I know I would. 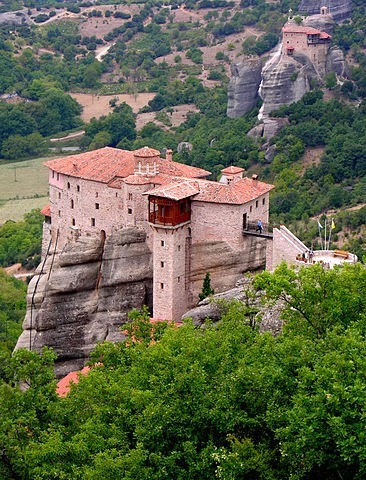 The Holy Monastery of Rousanou at Meteora.